After two weekend trips to Maine where we bagged 6 (count 'em) four thousand footers, this weekend we decide to stick closer to home. We had hoped to climb Baldpate, another hundred highest in the Mahoosuc Range, a strenuous hike with great views. Unfortunately, the weather doesn't cooperate and the chance of rain is high and the cloud deck too low to waste on Baldpate with its views. So we decide to tackle North and South Weeks - two of the hundred highest up in the north country hanging out on the Kilkenny Ridge Trail between Cabot and Waumbek. The last time we were up there was last June when we climbed Cabot, Bulge and Horn - good memories - Dejah, Nancy's daughter's yellow lab, was with us. Now she's in Texas and we miss her. Anyway, since it's a long drive we meet in Keene at 5 a.m. and start our journey north. The morning is foggy and humid and as we drive we are content with our decision not to climb a peak with a view. We talk, as is our wont, on these long drives. We are comfortable with each other. We arrive at the Berlin Fish Hatchery around 8:30 and proceed to strip down to shorts and slather on bug dope. The mosquitoes are fierce. With overcast skies, temperatures in the upper 60's, and happy to be hiking, we start up the York Pond Trail at 9 a.m. Immediately we see new wildflowers and it takes us half an hour before we are actually warmed up and into the hike because we have to photograph every new flower that we meet. I love this part - I love seeing Nancy bending over to take a macro shot of a new wildflower. And this from a woman who barely noticed them last year - now she knows names and pauses often to let in their beauty. I love that. Almost immediately we reach a couple of stream crossings - the water is high but not too high - I decide to go for it with boots on and only get mildly wet. Nancy slips off a rock almost immediately and the hysterics begin early. Onward - the trail is gradual for the first mile and still gentle when it starts to climb. We find ourselves at the Kilkenny Ridge Trail junction at 10 a.m. That was a fast 2.4 miles. We turn south and start climbing up toward North Weeks. The trail is littered with blow downs and branches and we both spend time and energy clearing away logs and branches. I love clearing trails - I love building trails. Even as a kid when I lived in Costa Rica I remember playing in the flower bed next to the house, building pathways and roads for my Matchbox cars and trucks. I liked the looks of the tires tracks in the dirt and the overall patchwork of paths and trails, all leading somewhere and nowhere. As an adult, I loved to dig paths in the snow - around our house, neat, deep paths in winding arcs - not practical paths, personal paths - they didn't perform any useful function, but I loved to walk around the house and look inside on a frosty evening. I loved how they got deeper with every snow. I started clearing trails when I moved to my present home - 80 acres at the foot of Mount Monadnock. I simply can't walk on a trail without clearing fallen branches. It isn't part of who I am. So today, the trail is littered with branches - hikers that had gone before us actually stepped over and around some of these fallen trees - I wondered why they hadn't cleared them for the next person. No matter - I enjoyed every minute of it. And it's infectious - Nancy clears when she is in front and catches what I miss when she's behind. There are some blow downs that were going to require more than a strong back. None are impassable and there are clear herd paths around all of them. 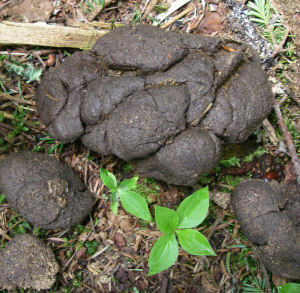 We see lots of moose droppings and what looks to me like horse poop or a Moose with diarrhea since it can't be a horse. We meet a hiker travelling down to his car parked near the Starr King trailhead. He exclaims over the amount of moose and bear droppings on the trail. 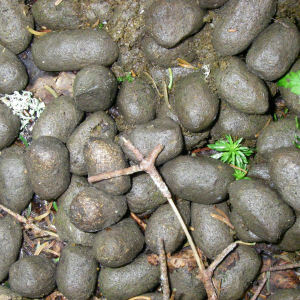 I said, "Wow - those are bear droppings? I thought it was the result of a moose with diarrhea." Unfortunately, we don't see a moose or a bear, but it is exciting to see evidence of both. The humidity brings out a good sweat - Nancy can actually wring out her shirt - wow - mine is damp and wicking just fine, thank you. We are both pushing the fluids and we feel great. We reach the summit of North Weeks at 11:45 a.m. We can tell we are on the summit because there is a worn patch of trail around a tree at the height of land and a bit of hardware on the tree where the canister used to hang. I wish there was a canister so we could read about other's adventures and write a few words of our own. We decide to eat lunch - both of us are starving despite a power bar and peanuts. All my deet has worn off from the sweat and the black flies are ferocious. I slather on more repellent and start eating my sandwich - it tastes like cardboard - and the bugs are relentless - I can't sit down and relax. I eat standing up, swatting at the nasty little buggers as they laughed off the repellent. We are off toward South Weeks twenty minutes later. We meet a couple who are also tagging the Weeks but don't stop to talk very long. First we have to lose some elevation before climbing again up to Middle Weeks - lots of blow downs. Down the south side of Middle Weeks and back up to South Weeks. 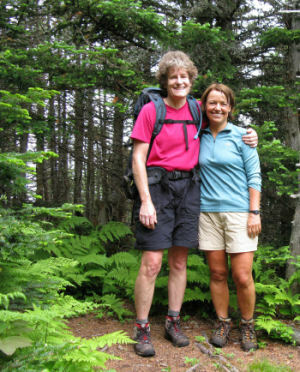 We reach the short spur at the 90 degree turn of the trail and hit the summit at 3:15 p.m. Nancy changes her boots - more toe pain and I change my socks while the black flies ferociously try to assert themselves. I am up and moving as fast as I can get my boots back on. We travel back quickly, making good time. The rain that had held off starts to fall lightly and the canopy of leaves above our head barely allows the drops to get through. We put on pack covers and nothing else - it's warm enough to walk in the rain. We arrive at the parking lot at 5:30 p.m. I am amazed at how good I feel physically - we have hiked high mileage every weekend in June and the 12.8 miles we walk today feel, dare I say it, easy. As usual it feels so good to sit down with our ice cold beverages before we buckle up and start the long drive home. The rain starts to really come down once we hit Rte 93 - the tires on my car are at the end of their effective lives and I am anxious about hydroplaning. I drive more slowly than usual and can feel the constant drumming of the rain lulling me to sleep. Nancy and I talk and it helps. There is a deep satisfaction in this hike - clearing trail almost like clearing the detritus from my own life, making it easier for me and anyone who walks beside me to move forward unimpeded.